Your discs don’t “slip” or “go out of place.” This is one of the biggest misconceptions people have about back pain. They think their discs “slip”, need to be “put back” and then the image this creates of what’s happening in the body leads to further pain because it seems dangerous and you are unsure about what is really happening. In this video I recorded with Dr. Derek Nielsen of Kaizen Physical Therapy, we talk about what it really means to “slip a disc” and why “slipping a disc” doesn’t really exist. Often people think their discs “slip” because family, friends, relatives or even medical providers are saying this is what is happening and acknowledging the fear. Your back may hurt a whole lot and that’s probably all that is going on. It hurts, it’s tight, it’s tired, and it’s still strong. Usually, this is diagnosable through a full body movement assessment by going to a physical therapist. A physical therapist and back pain expert will know exactly what’s going on and how to fix it. They will look at how your upper back moves, how your hips move, how your neck moves, etc. Watching you move and listening to you talk about what has happened can tell us a lot more about how to help you return to an active lifestyle than what you’ll find from an MRI or just getting a “slipped disc” diagnosis. I’ve seen patients who’ve come in and said that their MRI shows they’ve “slipped a disc” or have a “bulging” disc. When we evaluate them, their back moves great. It’s their hips or something else that isn’t moving well. Yes, maybe your back hurts and is the problem, but it doesn’t mean it’s injured or even hurt beyond repair. If there is a term to be used, it would be herniated disc, not “slipped” disc. Even a herniated disc heals over time which is proven in the research and it doesn’t always cause you to experience pain. 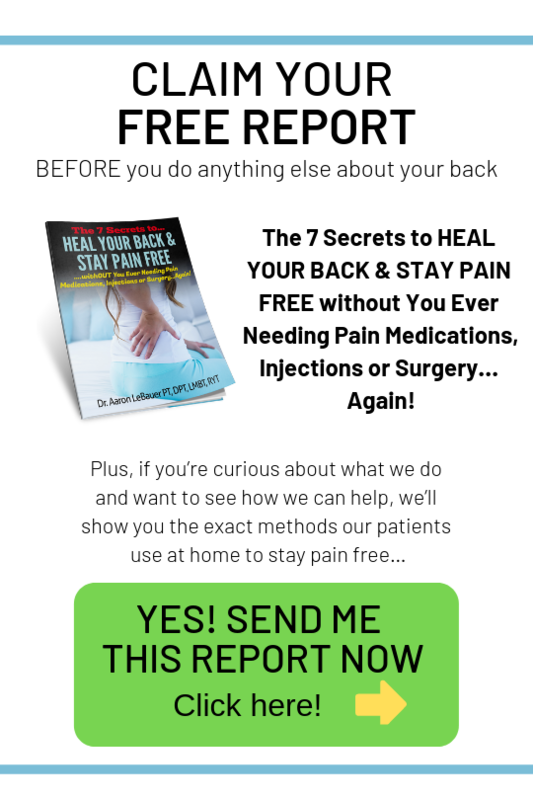 If we took 100 pain-free people off the street right now and gave them all an MRI, sixty four percent of them would have some kind of finding that’s either a herniated disc, a degenerative disc disease, arthritis spondylitis or some other scary term. That number may sound really scary, but remember, they all have no pain. That’s the key. These diagnoses are 100% normal. As you age it like having wrinkles on the inside. The number one thing you should do if you feel like you’ve “slipped a disc” or “thrown out your back” is to keep moving. Find some kind of movement that feels okay, that doesn’t make it worse with every step. That might be gentle motions, a bit of yoga or even just walking around the block. If the pain persists, or you can’t move, contact a physical therapist & back pain expert because they will be able to tell you exactly what’s going on and how to fix it without you 1st getting an MRI, going in for an injection or even needing to discuss surgical options with your M.D. If you’re interested in that, click the link below to set up a free appointment where you’ll learn exactly what is going on, how long it will take for you to heal and how we can help you fix the problem. If you’re experiencing back pain, click here to talk to a PT first!